“The Mission of McGill University is the advancement of learning and the creation and dissemination of knowledge, by offering the best possible education, by carrying out research and scholarly activities judged to be excellent by the highest international standards, and by providing service to society. It is imperative that we uphold these tenets upon which the McGill University community is built. The Principal’s Task Force on Respect and Inclusion in Campus Life is mandated to recommend a set of concrete measures by which the University may ensure the full and effective operationalization of its core principles across all University activities but with particular consideration paid to student life at McGill. Design and implement a University-wide survey of students, faculty and staff to assess the extent to which our existing structures facilitate or inhibit free expression, respect and inclusion, with the survey to be completed by 7 December. Consult broadly with students across both campuses, through student organizations and via scheduled focus-group consultations, across the period November 2017 through January 2018, to identify areas of particular concern and/or strength. Identify and examine successful initiatives and best practices at peer institutions with respect to the protection and promulgation of core values. The Principal’s Task Force on Respect and Inclusion in Campus Life will provide a progress report at the February 21, 2018 meeting of Senate, a status report for discussion at the March 28, 2018 meeting of Senate, and will submit its final report and recommendations to Principal Fortier by April 27, 2018. The report will be made public shortly thereafter and will be formally presented at the May 16, 2018 meeting of Senate. An update on actions taken and moving forward will be presented and discussed at the September 2018 meeting of Senate. demonstration of insight into existing and emerging challenges that fall within the scope of the Task Force mandate. 1. Comments and input from members of the McGill community are welcomed. Correspondence can be directed to principals.taskforce [at] mcgill.ca and will be brought to the attention of the members of the Task Force. has implemented a University-wide survey of students, faculty, and staff to assess the extent to which our existing structures facilitate or inhibit free expression, respect and inclusion. This survey was completed on 7 December, with the results informing the Task Force’s future work. through policy research and analysis, is exploring successful initiatives and best practices at peer institutions with respect to the protection and promulgation of core values. through intensive consultative processes, will identify areas of University life that are susceptible to being particular sources of tension and where the operationalization of our core principles needs attention. First with small focus groups comprised of a mix of students, faculty and staff in January 2018. Second, through an Open Forum on Campus Culture to be held on Wednesday, 24 January 2018 from 14:30-16:30 in Leacock 232. Third, by inviting input from specific University officers and campus groups, including student and staff constituency associations. With the aim of creating an opportunity for frank, in-depth, and meaningful conversation, the Principal’s Task Force on Respect and Inclusion in Campus Life will hold five focus group consultations in accessible locations at the downtown and Macdonald campuses (see schedule below). These will be small, closed-door meetings, with questions proposed by the Task Force to guide the discussions. Each session will last about 90 minutes, and will include 20 participants. Fifteen spaces in each group will be reserved for students; the remainder will be allocated to faculty and staff. We welcome discussion in both English and French. We hope these sessions will attract a broad cross-section of the University community. These small group meetings may be particularly appealing to people who may not be comfortable speaking in large public gatherings. We invite individuals from across the McGill community to sign up for one of these focus groups on a first-come, first-served basis, through this link. Registration will open on Friday, January 12, 2018, at 9h00 In order to involve as many people as possible, potential participants will be able to sign up for one focus group only. The Principal’s Task Force on Respect and Inclusion in Campus Life is hosting an Open Forum on Campus Culture on Wednesday, January 24 from 14h30-16h30 in Leacock 232. 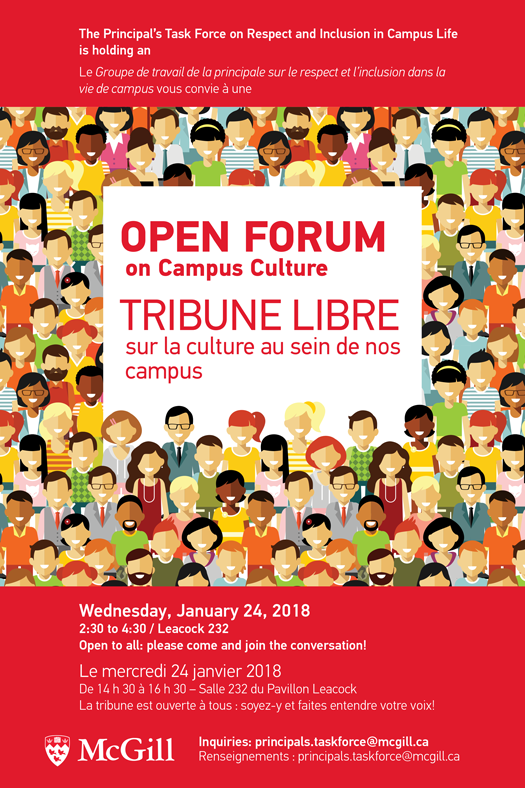 All members of the McGill community are invited to attend the Open Forum to discuss how best to encourage the open and respectful expression of the variety of opinions and experiences on our campuses. The Open Forum is part of an ongoing consultation process, including the Fall Term survey on respect and inclusion on campus, and a series of focus groups scheduled throughout January. We hope the Open Forum will attract participation from a cross-section of the University community to capture a broad range of points of view. For those who can't attend, the session will be livestreamed. At any time, you can send comments by email to principals.taskforce [at] mcgill.ca. The Task Force welcomes brief written submissions from on-campus groups (e.g., unions, student associations, clubs, media organizations), in which collective concerns and experiences can be shared, and recommendations can be proposed. Submissions, which should not exceed two pages, should be a Word or PDF attachment to an email sent to principals.taskforce [at] mcgill.ca by January 31, 2018. Please indicate clearly the constituency on behalf of which the submission is being made.